On June 21-22, the WCGMC returned to St. Lawrence County for more mineral fun. Green growth now obscured the rocks a bit and mosquitoes and black flies greeted the 19 club members who arrived at Selleck Road in Pierrepont on Saturday morning. 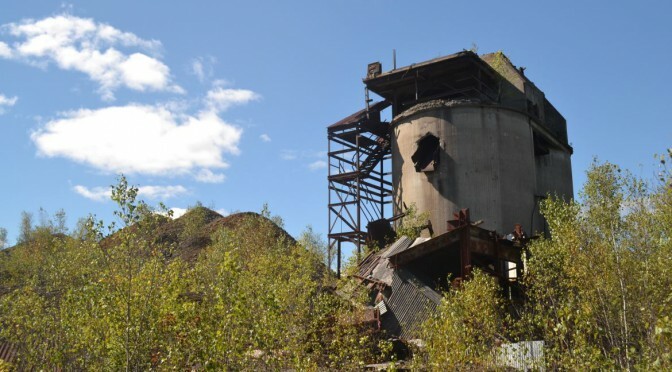 The two day trip would also include the Powers Farm and two sites where Pierrepont ZCA zinc ore has been stockpiled for road use (or perhaps for collectors?). Twenty-three WCGMC members converged on Star Lake, NY on the morning of Saturday May 31st for a visit to Benson Mines. We found lots of sillimanite, some fresh, some altered a pretty light green, lots and lots of magnetite including small crystalline surfaces along with massive ore, and huge muscovite books. Jerry Curcio explored ahead a bit at the north end of the property and found an orange calcite boulder that contained large green crystals that appeared to be sillimanite. We later confirmed that identification with Marian Lupulescu. 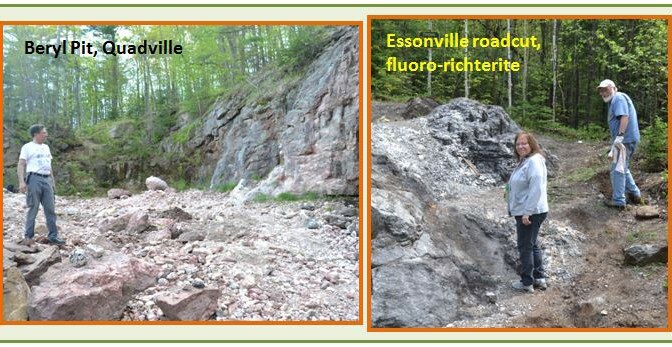 For more on Benson Mines see his paper in the Rocks and Minerals February, 2014 issue or go back to our Feb. 2014 newsletter where it was highlighted as the Site of the Month. Green sillimanite offset in orange feldspar, a very pretty combination. In mid-afternoon it was on to Fine, NY for a quick stop at the skarn outcrop just off the parking area at the intersection of highways 3 and Highway 58. 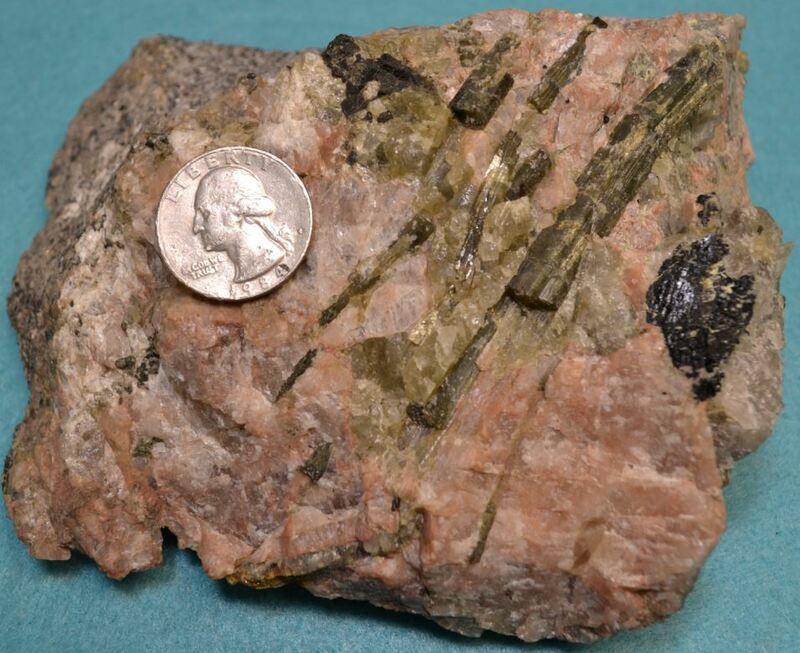 Steve Chamberlain has proclaimed the coarse grained pyroxene (diopside?) and feldspars from this location to be “aesthetically challenged”, but that did not prevent us from scavenging a few for our gardens or collections. Etched and dull, these large dark green pyroxenes and their long and varied cleavage surfaces may not end up in too many mineral display cases, but they can look nice in a garden or on a patio wall. 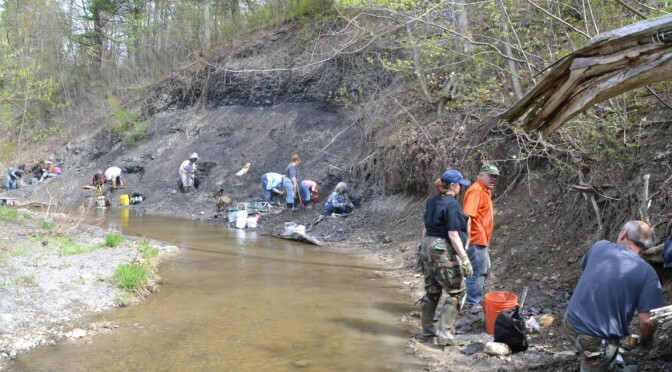 WCGMC has been informed by the new owner of the property off Route 20 in Alden that the Spring Creek area where we have enjoyed collecting pyritized fossils for a long time is now off limits to collecting. The new owner has informed us that in the future he will treat “fossil collectors as trespassers”. Given the new owner’s wishes, as of June, 2016 WCGMC is not planning any future trips to this area and the site should be considered closed to collecting. 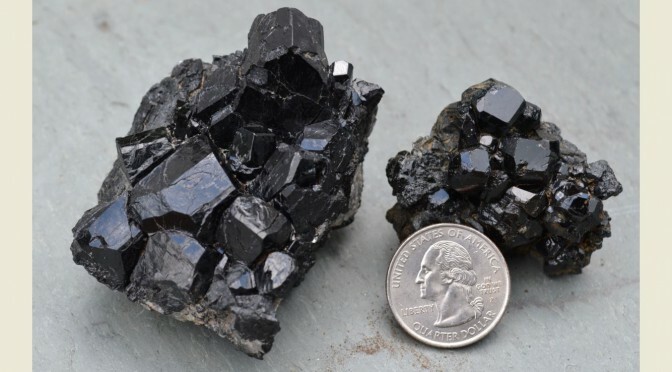 Many of us have a special passion for collecting aesthetic and/or unusual minerals, while others prefer the varied forms and diverse variety offered by the early-mid Paleozoic fossil collecting that can be done in western New York. There is one site that can please both groups of collectors. Along Spring Creek in Alden, NY, the rich and diverse Devonian fossil assemblage we have all come to know and love is locally fully pyritized. Opening the fissile shale surface not only reveals a 380 MY old fossil, but a shiny mineral specimen as well. The prize is a pyritized fossil. Cephalopods, brachiopods, and ammonites are the most common, but two species of trilobites have also been found completely replaced by the iron sulfide mineral pyrite. Just north of US Route 20 as it passes through the small town of Alden, NY, Spring Creek has carved itself deeply into the Middle Devonian Ledyard Shale Member of the Ludlowville Formation. Known for decades, the site is readily available to all with two legs, a hammer, a backpack (or even large pockets), and the willingness to perhaps get a little wet and mostly certainly muddy. A short hike along well beaten trails leads to the creek which can be accessed at several sites. Fourteen of us can be seen at one of those sites in the cover photo above.